The Future of Indian Spirituality | Fourth Dimension Inc. The spiritual mind of India has to reinvent a more integral spirituality which can bring out a spiritual transformation of the entire life of human beings. 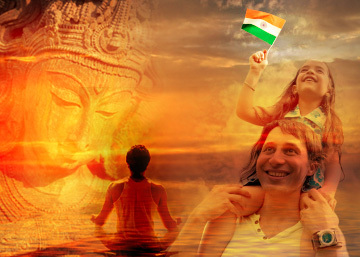 A spiritual ideal has always been the characteristic idea and aspiration of India. But the progress of Time and the need of humanity demand a new orientation and another form of that ideal. The old forms and methods are no longer sufficient for the purpose of the Time-Spirit. India can no longer fulfill herself on lines that are too narrow for the great steps she has to take in the future. Nor is ours the spirituality of a life that is aged and world-weary and burdened with the sense of the illusion and miserable inutility of all God’s mighty creation. Our ideal is not the spirituality that withdraws from life but the conquest of life by the power of the spirit. It is to accept the world as an effort of manifestation of the Divine, but also to transform humanity by a greater effort of manifestation than has yet been accomplished, one in which the veil between man and God shall be removed, the divine manhood of which we are capable shall come to birth and our life shall be remoulded in the truth and light and power of the spirit. It is to make of all our action a sacrifice to the master of our action and an expression of the greater self in man and of all life Yoga. The West has made the growth of the intellectual, emotional, vital and material being of man its ideal, but it has left aside the greater possibilities of his spiritual existence. Its highest standards are ideals of progress, of liberty, equality and fraternity, of reason and science, of efficiency of all kinds, of a better political, social and economical state, of the unity and earthly happiness of the race. These are great endeavours, but experiment after experiment has shown that they cannot be realized in their truth by the power of the idea and the sentiment alone: their real truth and practice can only be founded in the spirit. The West has put its faith in its science and machinery and it is being destroyed by its science and crushed under its mechanical burden. It has not understood that a spiritual change is necessary for the accomplishment of its ideals. The East has the secret of that spiritual change, but it has too long turned its eyes away from the earth. The time has now come to heal the division and to unite life and the spirit. This secret too has been possessed but not sufficiently practised by India. It is summarised in the rule of the Gita, yogasthah kuru karmani. Its principle is to do all actions in Yoga, in union with God, on the foundation of the highest self and through the rule of all our members by the power of the spirit. And this we believe to be not only possible for man but the true solution of all his problems and difficulties. This then is the message we shall constantly utter and this the ideal that we shall put before the young and rising India, a spiritual life that shall take up all human activities and avail to transfigure the world for the great age that is coming. India, she that has carried in herself from of old the secret, can alone lead the way in this great transformation of which the present sandhya of the old yuga is the forerunner. This must be her mission and service to humanity, – as she discovered the inner spiritual life for the individual, so now to discover for the race its integral collective expression and found for mankind its new spiritual and communal order. Our first object shall be to declare this ideal, insist on the spiritual change as the first necessity and group together all who accept it and are ready to strive sincerely to fulfill it: our second shall be to build up not only an individual but a communal life on this principle. An outer activity as well as an inner change is needed and it must be at once a spiritual, cultural, educational, social and economical action. Its scope, too, will be at once individual and communal, regional and national, and eventually a work not only for the nation but for the whole human people. The immediate object of this action will be a new creation, a spiritual education and culture, an enlarged social spirit founded not on division but on unity, on the perfect growth and freedom of the individual, but also on his unity with others and his dedication to a larger self in the people and in humanity, and the beginning of an endeavour towards the solution of the economic problem founded not on any Western model but on the communal principle native to India. Our call is to young India. It is the young who must be the builders of the new world, – not those who accept the competitive individualism, the capitalism or the materialistic communism of the West as India’s future ideal, nor those who are enslaved to old religious formulas and cannot believe in the acceptance and transformation of life by the spirit, but all who are free in mind and heart to accept a completer truth and labour for a greater ideal. They must be men who will dedicate themselves not to the past or the present but to the future. They will need to consecrate their lives to an exceeding of their lower self, to the realisation of God in themselves and in all human beings and to a whole-minded and indefatigable labour for the nation and for humanity. This ideal can be as yet only a little seed and the life that embodies it a small nucleus, but it is our fixed hope that the seed will grow into a great tree and the nucleus be the heart of an ever extending formation. It is with a confident trust in the spirit that inspires us that we take our place among the standard-bearers of the new humanity that is struggling to be born amidst the chaos of a world in dissolution and of the future India, the greater India of the rebirth that is to rejuvenate the mighty outworn body of the ancient Mother.